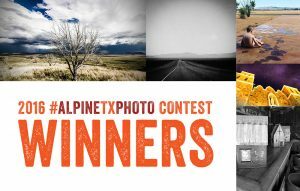 The City of Alpine is pleased to announce the winners of the 2016 Alpine Photo Contest! Click here to view the winners, finalists, semifinalists and all the fantastic contest entries for 2016! This year’s contest judge was Terlingua artist, Crystal Allbright. Handed a Kodak Instamatic at an early age, she has been looking through viewfinders and pushing shutter releases ever since. Her passion for photography became firmly rooted through studies at Austin College in Sherman, Texas. After a move to West Texas in 1990, she continued her studies and worked for the media department at Sul Ross State University in Alpine, Texas. The darkroom days came to a close for Allbright when she moved to Terlingua. Water quality and quantity was a concern, and it was not until she finally succumbed to digital photography, that her dedication to the medium was revitalized. Allbright was the Alpine Artwalk featured artist in 2011, and has been a presenter at Alpine’s 2011 Shooting West Texas Photo Symposium and recently at the Museum of the Big Bend’s 2016 Alpine Photo Weekend: Look, Learn & Shoot. A career highlight for Allbright was being the photographer for the 2015 Big Bend National Park Calendar. She loves to hand cameras to creative youngsters through art programs at Terlingua School, the Big Bend Ranch State Park and the Mark Kneeskern Summer Art Camp. Her work can be viewed at her web site, crystalallbright.com. “First of all, THANK YOU, photographers, for sharing something that makes ALPINE special to YOU. “Alpine is a place of beauty and community. It is a place close to my family. My mother, Ruth Allbright, loved Alpine so much, she spent much of her life planning to retire there and spent those golden years woven into the community. My sisters raised their families there. So when I was asked to judge this photo contest, I thought of all the elements that I have witnessed for fifty years, and I tried to come away with a selection of photographs that help define Alpine. It would be so hard to capture all of its diversity in one image, and that made it very difficult for me to select a ‘winner’, much less a finalist or a semi-finalist. “When viewing the photos, I mentally noted categories…landscapes, townscapes, portraits, macro shots, etc. Then I applied photographic and artistic elements to narrow down the field. I looked for interesting compositions and quality in technical aspects. How do my eyes travel through the image? Boy, that white is blown out? Was a filter or effect used? How about that vignetting? Is it too pixelated? Does the blur contribute to the mood, or do I need a place to focus? Does anything distract from the effectiveness of the shot? I asked questions. “To help reach the finalist stage, I asked of each photograph: Does it tell a story? Does it evoke awe or curiosity? Did the photographer take a well-worn subject and put a fresh look to it? How does it reflect the overall theme of Alpine, Texas?